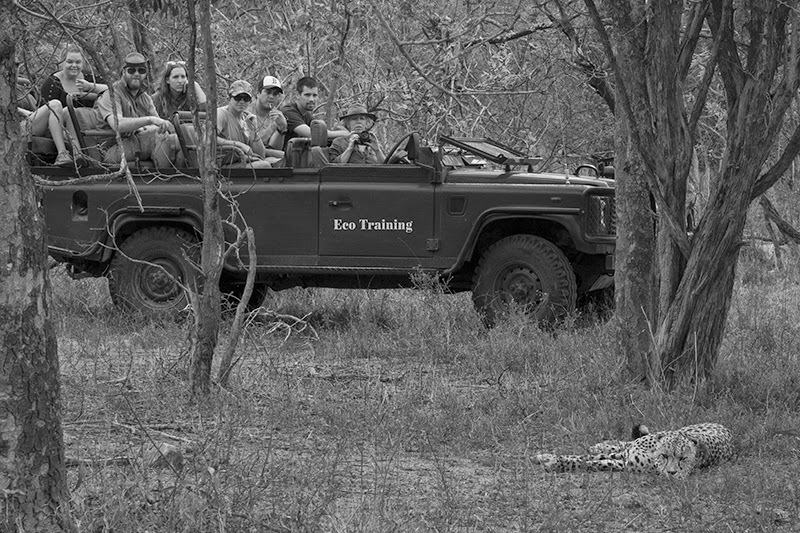 A private game reserve may sound like a utopia to many of us. It is an enclosed space where we have the honour of viewing some of the most beautiful, iconic and dramatic animal life on the planet. But for its inhabitants, they have been unknowingly cast into a battle for available resources. It is a battle where, size matters, strength matters and where numbers often triumph. When species are fighting for specific resources it is inevitable that conflict will reign and for every winner, there must be a loser. The world’s cheetah population is a lot lower than most of you might have realized. Best estimates suggest that there are less than 10,000 of this fleet-footed feline are left on the planet. 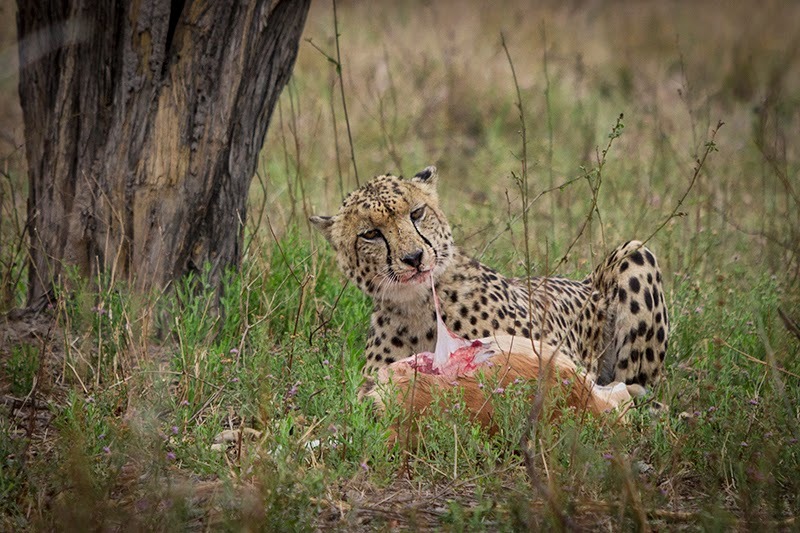 The cheetah is a species best suited to wide open spaces and thus its last remaining stronghold consists of Namibia and East Africa, but there are still pockets of resistance dotted throughout the network of private reserves in SA. These over grazed areas are dominated by woodland due to cattle farming but some individuals have altered their hunting habits learnt to survive. But it is an uphill struggle and one that many are not winning. Evolution takes millions of years and a species thrown into new surroundings will always suffer. In the private game reserve scenario, there is nowhere to hide from your competition. Artificial lines have been drawn in the sand and the pressure from the larger and more numerous predators is unrelenting. In the past 6 months, Karongwe has lost 2 of it last remaining 3 cheetahs thanks to the survival instinct of the local lion pride. A species cannot exist without access to resources, and any drain on those resources means that its eradication is paramount. Lions do not share and they have systematically removed this threat. 1 male cheetah is all that is left of the local resistance but of late he has been sighted twice in the south of the reserve close to our camp. The EcoTraining students had all but given up hope of finding this veritable needle in a haystack until we bumped into him with a freshly killed impala ewe a few weeks ago. As it was after dark, and bearing in mind the threat of the nocturnal power of the hyaenas and lions, we chose to leave him in peace. However, last week, as we returned from a morning drive, we found him once again, this time with a freshly killed impala ram. His streamlined body lay next to his prize, panting heavily to recover the energy exerted during the chase. The impala had not yet even been opened and thus we knew we had missed the capture by minutes. As we watched him catch his breath, he eyed us carefully, the recent loss of his brother no doubt playing a part in his trust issues. Finally however he relaxed and settled down to claim his protein-rich reward. 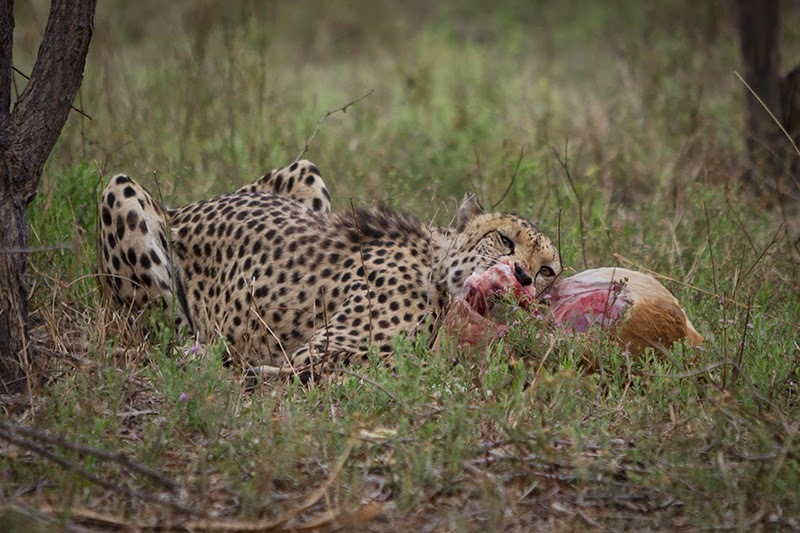 We watched as his carnassial teeth sliced through the impala’s rump to expose the tender flesh. A cheetah is always afraid of interlopers during this time as he cannot defend himself, or his kill, against the larger predators with whom he shares his domain. His head bobbed up and down as he alternated satisfying his hunger and surveying the surroundings for danger. By 11 o’clock however, nature’s undertakers had begun to arrive. A white backed vulture sat ominously in the trees close by waiting for its opportunity. 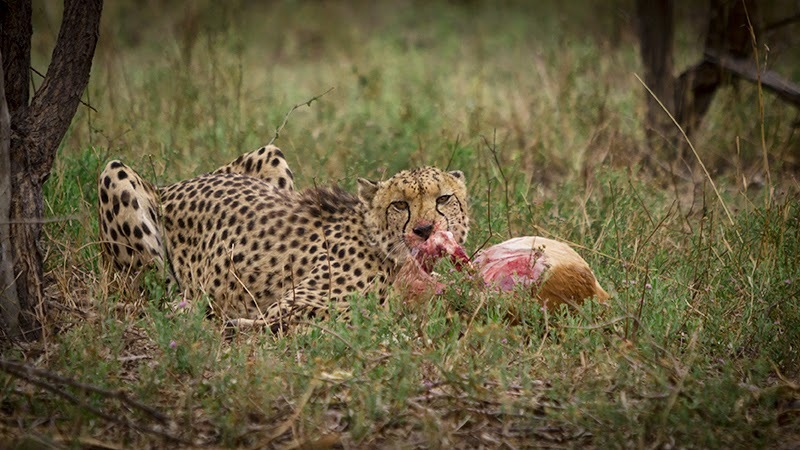 Even Job cannot challenge the vulture for its patience and as the minutes ticked by, more black shadows seemed to appear from the ether, descending towards the cheetah’s dinner table. 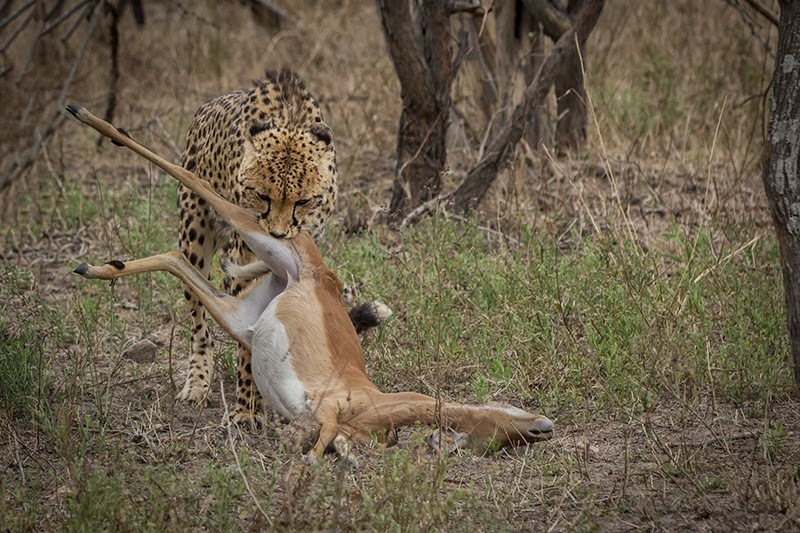 By the time we returned to the scene that afternoon, all that was left of the impala was a tattered piece of skin and a few splintered bones. The vultures sat innocently in the surrounding trees, crops visibly full, and there was no sign of the cheetah. Undoubtedly disturbed by the pestering presence of the feathered scavengers, he had most likely slipped away to digest his food in peace. 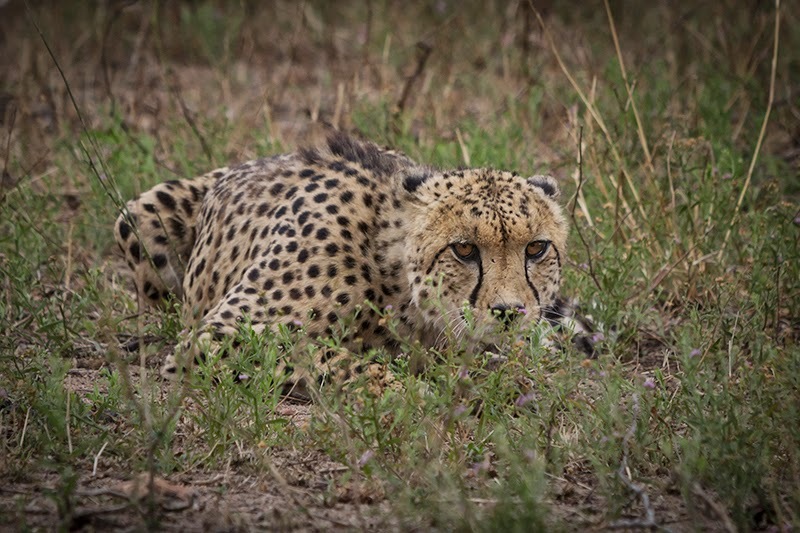 Learning to be unseen and to avoid competition is the only way the last remaining member of Karongwe’s cheetah population can survive. Evolution may take millions of years, but behaviour can change quickly. It is this ability that lends hope to this elegant enigma and I personally cross all my fingers that he can do just this. The private game reserve phenomenon may have hampered his opportunities - no more can he just vacate an area and seek asylum in a less predator rich environment, but without it, he would have no doubt succumbed to Man’s unrelenting expansion. A typical cheetah might range over 500-1000 square kilometers and while the boundaries of Karongwe may only be a tiny percentage of this, his chances here are far higher here than outside these fences. Farmers protect their livelihood without mercy and kill with far less provocation and far more frequency than lions. The private game reserves are not perfect, but without them, there is a very real possibility that this docile and beautiful animal would have been extinct by now, and we would have been denied the opportunity to see one of nature’s most exquisite creations.